A zebra at rest with no threat of predators, for instance, will be operating within the “rest and digest” functions of the parasympathetic nervous system. When chased by a lion, drastic physiological changes with the activation of the fight-or-flight response of the sympathetic nervous system : heart rate increases, breathing increases, large amounts of stress hormones like cortisol and adrenaline are released into the bloodstream, pupils dilate, blood pressure increases and any non-essential functions like digestion stop. The zebra’s nervous system prepares it to run for its life. If the zebra is caught, the nervous system is overwhelmed, and has no further solutions - this is the freeze response. This point is what we consider trauma. Zebra that survives the encounter literally “shakes it off” and returns to a resting state. The autonomic nervous system is common to all mammals. However, humans have a pre-frontal cortex, which zebras do not. This is usually an advantage, but the disadvantage is that we mentally replay traumatic scenarios, which activates our sympathetic nervous system exactly like the real threat would. Hyperaroused organizations will display effects of “constant vigilance” and be hyper-aware of threats which take energy away from moving forward. They are “stuck on on”. Often times this is reflected in how leadership approaches outages and issues. Wartime metaphors, etc. Production support teams. The signal may seem similar, but it’s not exactly the same. We look for pattern recognition because the signals seem the same as previous examples, but the complexity makes this inappropriate. We need to learn to stop jumping on the first root cause. And look - more zebras. What can we do to understand our window of tolerance as an org? How can we identify when we are deregulated? No, this is not a Warren G reference. How do humans and organizations take a deregulated state and become regulated? Obviously, we can’t do the exact same thing. But what are some things that we can do, to help achieve the same result? We want to make an association with outages and issues with a safe place. Game days can help do this, but they have to be done properly. Keep them low stress and safe - the point isn’t to practice under pressure, but to associate response with a safe environment. If you do planned failure injection in a gameday, run them like a real incident. Failure Fridays at Pagerduty for example. We follow full Incident Command processes. This causes an organizational association of a safe place for incidents. Blameless is just the beginning here. We need to process the failure/outage through all the information that we have, and the processing needs to have a conclusion. Otherwise it is unprocessed trauma. 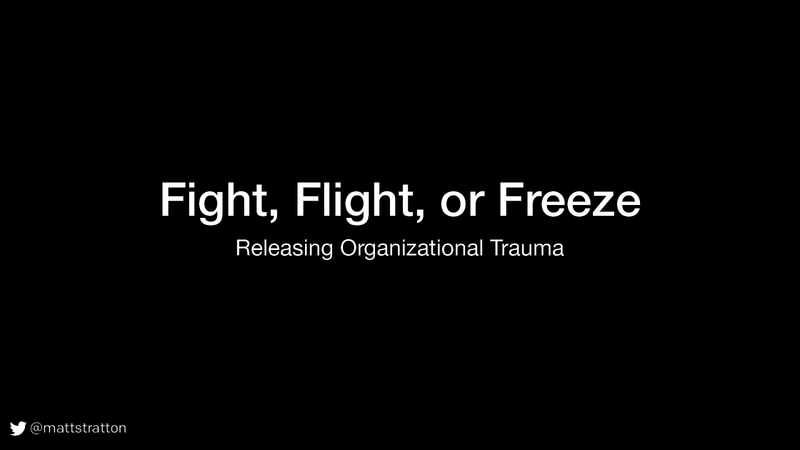 There is a misconception that to process trauma is to “get it all out”. We need to integrate our experiences into a coherent whole. This includes telling our stories as well as changing our autonomic nervous systems, which in the case of an organization has to do with how we respond to outages and incidents. It’s essential to tell our stories. That’s how we process them. This happens for individuals but also for your larger organization. In top down therapy, it starts with the emotions. Why do you feel the way you do. This is very similar to looking for a root cause first. In somatic experiencing, the body is worked with first, to enable a titrated approach to the emotions. Similarly, during an incident you are working to restore service prior to determining cause. And it’s important to look at the whole system when processing it, not starting with the surface “emotions” which are the symptoms of the outage. As Hannah mentioned yesterday in her talk, being resilient means that we don’t see things from the perspective of things that happen TO us. It is a matter of what can we do going forward. A culture of blame creates a culture of helplessness.